Since about 1970, the cross-linked Polyethylene (XLPE) -insulated power cables have been used in Germany. This insulation possesses very good electrical, mechanical and thermal characteristics in medium voltage networks. This type of insulation has excellent chemical resistance and is also resistant to cold temperatures. Due to various advantages, the XLPE-insulated type has vastly displaced the traditional classic paper-insulated types in many sectors. In order to prevent the penetration of moisture and also to extend the duration of life, the XLPE insulated medium voltage cables are designed with longitudinally waterproof shielding including an additional swell tape and PE outer jacket. The manufacture of this jacket is based on high density polyethylene (HDPE), in which an additive organic peroxide is mixed. Due to the heating and pressure the molecule chains are joined together, assuring the transition from thermo plastic to elastic condition. In comparison to PVC and paper-insulated cables, the advantage of XLPE-insulated medium voltage power cables is that they possess a low dielectric factor, such as it is 100 times smaller than of PVC-insulated cables. Moreover, a better dielectric constant value has has an effect on the low mutual capacitance, the short circuit to ground and the charging current of XLPE-insulated cables. The good properties of these cables remain constant at a wide temperature range. 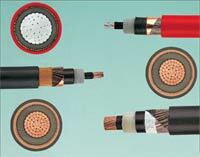 Copper or Aluminum, round, multi-wire stranded and compact, according to VDE 0295 and HD 383. Semi-conducting compound, cross-linked, min. wall thickness 0.3 mm. The difference between the maximum and minimum value of 0.5 mm should not be exceeded. Shielding of copper wires must have a minimum diameter of 0.5 mm and over that a copper tape applied helically with a minimum thickness of 0.1 mm. Copper cross-section according to DIN VDE 0273 and 0276. Over the shielding as well as under the outer jacket a separating layer must be used (e.g. tape). In order to avoid any damage, the XLPE insulated medium voltage power cables should be carefully laid and installed. It must be ensured that the cables should not be pulled over hard or sharp edges. The cable ends must be sealed water-tight. After cutting the length both ends must be sealed immediately. An installation depth of 60 to 80 cm is recommended. Single conductor cables are normally arranged in a trefoil touching or triangular shape. For installation in conduits, especially the influence of thermal insulation of air space between the cable and the inner wall of the conduit should be considered. The inner diameter of the conduit should be at least 1.5 times that of the diameter of the cable. Cables for conduit system installation in ground, a reduction of the current carrying capacity with a factor of 0.85 is recommended. During the operation or after installing the medium voltage power cables, the dielectric can be tested with alternating or direct current. The test duration continues 30 minutes.